This is a quilt top that is currently on my UFO list because it still needs to be quilted. However, I thought it would be appropriate for today’s post :). This split applique is very easy to do – I learned how to do it in a class taught at Plain and Simple. Basically you create a heart template in 3 sizes – small, medium, large. 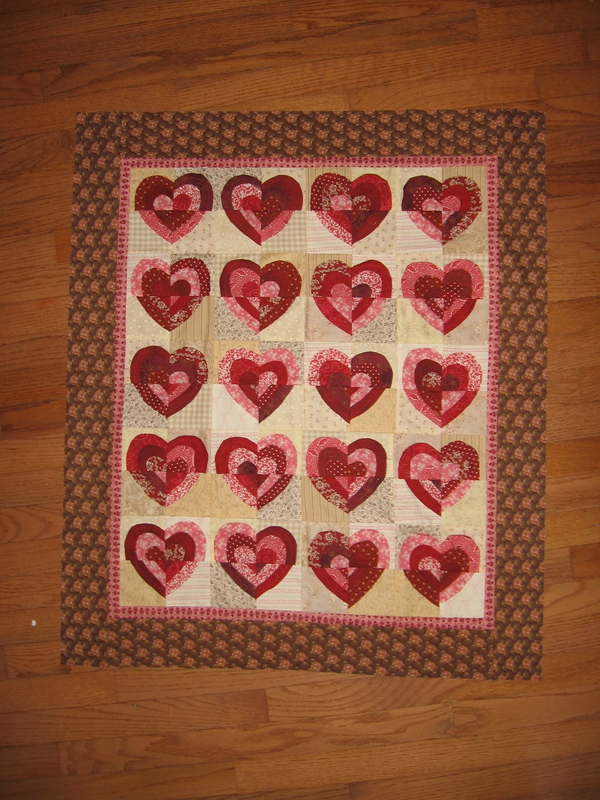 You get scraps of red fabric and cut out one of each heart for each block you want to make. You begin by sewing small heart on top of the medium, then sewing this unit on top of the large heart, and then sewing this onto your applique background. This is rough edge applique, meaning that you don’t need to prep the pieces to turn the edges and you don’t need to hide your stitches. You just sew around the rough edges of each shape, about 1/4″ in from the edge. After completing your blocks, you cut each one into fourths. Then you randomly select 4 pieces and sew them back together as a new heart. I really enjoyed this project, and it’s a great for people who are just learning how to quilt. I haven’t quite decided how to quilt this yet, because I don’t want to quilt over the hearts. When this is washed, the rough edges will ravel and the hearts will look like they have a bit of a ruffle or fringe around the edge. It’s a nice effect for something like this. This entry was posted in Applique, Holidays, Quilting. Bookmark the permalink. I love this quilt! Have to try it. Thanks for the inspiration. Thanks for visiting! If you try this, let me know how it goes. Also, I really like how you share the class tips on your blog! I would love to go to some of these classes one day – they sound like a lot of fun and very educational. Very nice!!!! Depending on the size of the quilt you could just frame it. Either was it is a wonderful quilt!!! Wow, very nice. I am so glad to have a daughter and a mother than can do all these things. I am very happy being the center of the sandwich. Haha, the sandwich is a great way to look at it! You do benefit a lot from all the things we make for you :). However, I recall that you are pretty good at making jewelry!